Baseball history is all about the people, places and things. People make the history, the places add to the charm of the moment and the things, well………things happen! As fans, sometime we get the feeling we were born too late. We can find an era of baseball that really appeals to our inner fan. For some lucky fans their moment is in the present and for others it can be 100 years before they were born. Today’s book gives those fans the opportunity to live in those moments that they missed. When you are a fan of a particular team, the stadium almost becomes part of the game. From their unique dimensions, the sights, sounds and smells contained within to the time spent bonding with the stadium it almost becomes an old friend. These parks both new and old, have personalities all their own. Authors Rhodes and Erardi have taken us back in time to visit with an old friend. Crosley Field was the home of the Cincinnati Reds for over 50 years. 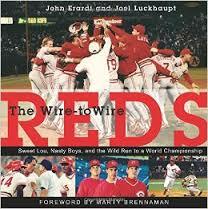 It was the site of some great moments in Reds baseball and of baseball history in general. 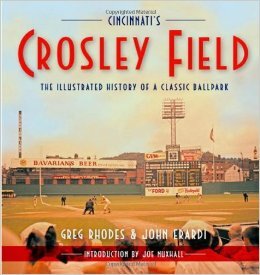 They have created more than just a picture book of Crosley field. 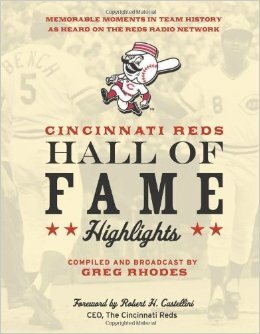 They have actually captured the personality and written the detailed story of a member of the Cincinnati family. You not only get all the nuances that made Crosley Field a great place to go see a baseball game, you get so much more. You get stories about the fans that visited, the growth of the game and how it pertained to the stadium and how Crosley fit into the growing populace of the city. The character of the stadium and physical changes within are captured in this book as well. This is really a comprehensive history that brings the old girl back to life. 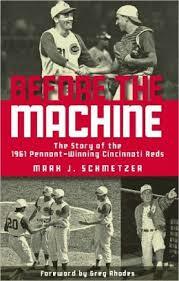 If you are a fan that has lost your old stadium due to the influx of new baseball palaces over the last 20 years, you should appreciate this book. The Reds may bot be your hometown team but we can all relate to losing the place we called home. I know as a Phillies fan, Veterans Stadium was my home away from home growing up. Quite honestly, it was a giant crap-hole……but it was our crap-hole. It has been reduced to rubble and is now a parking lot for the glorious new Citizens Bank Park. But when I think of some of my favorite memories with my Dad growing up, that old crap-hole comes back to life and will forever be a part of my life. This book has the same effect. If you were ever at a game there it will bring back great memories. If you were never there than this will paint a great picture of what the place was all about. Sometimes you can go home again……even if home is no longer there.